We’ve recently found a new excuse to consume additional amounts of sugar. And, at the same time, enjoy the heck out of our kiddos. Enter the s’more. A long time friend only recently introduced to our youngest family members. Our set up is nothin’ fancy. Just a little fire on the back porch. And lots and lots of gooey smiles. 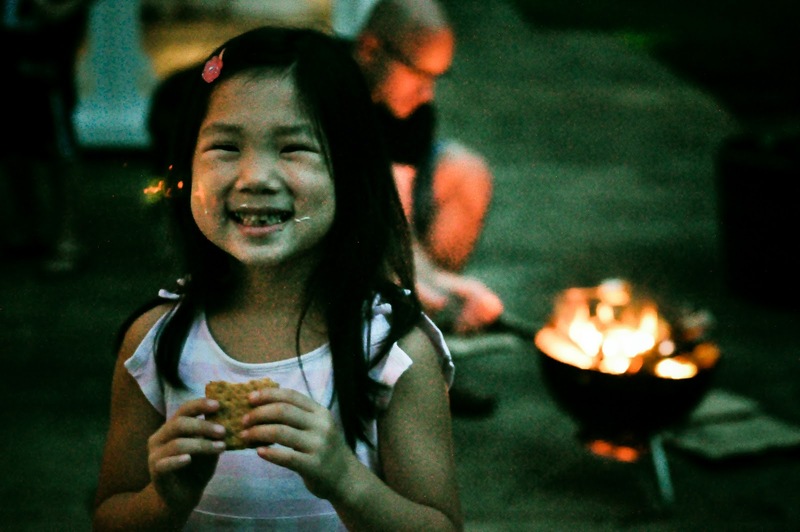 All the kids really enjoy “s’mores night” because it’s always a good time… hanging out, laughing, talking about silly stuff. 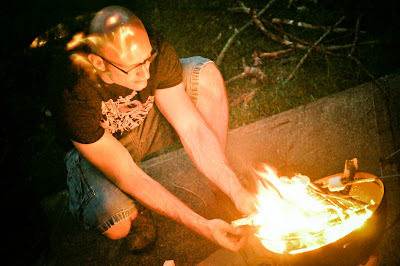 The grown ups get in on the marshmallow-roasting action, too. Because some of us like our marshmallows roasted just so. Ahem. Occasionally, the mosquitos get bad and we have to bring the party inside. But that doesn’t dampen our fun. 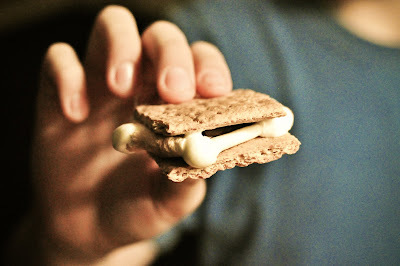 Or, unfortunately, remove the marshmallow from our fingers. P.S. 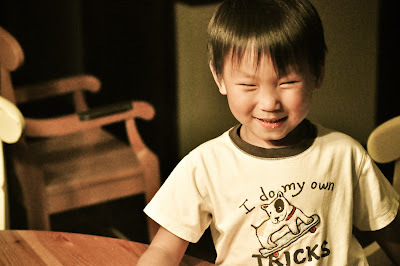 This was the first time I’d used my camera on it’s highest ISO setting (6400) and ewww… it got pretty noisy. But, despite the grain, I liked these pictures. P.P.S. Anyone know how to avoid the weird displaced flame phenomena when taking pictures near an open flame? My favorite Snapshot from last week was Kelly’s from The Raudenbush Family. Kelly, a fellow mom and clearly a fellow all-things-sweet lover, shared about her special “dates” with each of her children. What?!? Ice cream? Donuts? P. F. Changs?!? I wanna be a kid in that clan! Then add your link below. And don’t worry if your number doesn’t show up. For some reason, sometimes you can’t see your own number. But it is there. P.S. New to Sunday Snapshot? Click here to learn more. 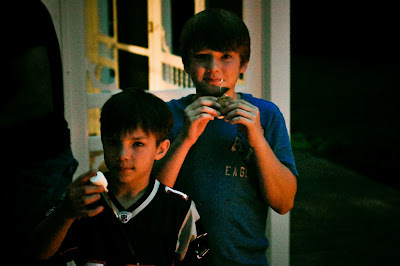 Smore's are the funnest! I love all the ooey gooey mess. 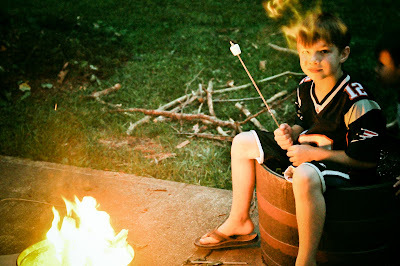 We are going to have to break out our fire pit and smore's this fall and enjoy the brisk air and maybe snap a few pics! Love em! Thanks for sharing. You posted it at just the right time for me to get mine linked! 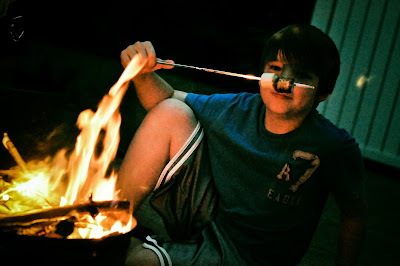 LOVE the smores pic! The grain makes it completely unique and perfect!! The grain gives a rustic, outdoorsy feel. It's good. Smore's are definitely a staple snack around our fire ring. They're a delicious classic. 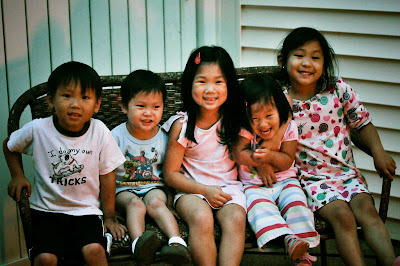 I have joined in the Sunday Snapshot fun today for the first time(ourgreenbamboo.blogspot.com); but I have been visiting your blog for a long time. Your crew always makes us smile!!! Smores are HUGE in our house – we have even had some so desperate as to put the marshmallows in the microwave. You can imagine how well that went!!! What wonderful pics and I love your topic of Sunday snapshots. I have been posting photos on Saturday and would love to have you stop by …. 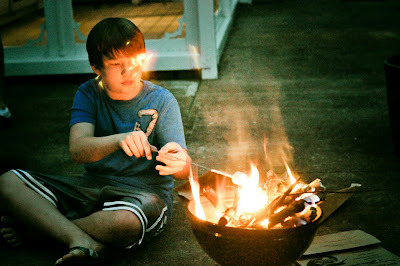 Never "done" s'mores; thought it took a campfire! You made it look so easy…. will need to try soon(once the heat lessens here!). Loved joining in and seeing your family. You are blessed! Thanks for stopping by. I didn't know if I should post your link because I posted on Saturday instead of Sunday. Would you still like me to post it even if I post our pics on Saturday? Sure, Sara! You can certainly post on Saturday and add your link on Sunday (I post on Saturday nights sometimes myself ;))… so just go ahead and add the Sunday Snapshot button to your Saturday post, and link up on Sunday! I've really been into grain these days. There's something tactile about the look of it, something yummy. And in LR3 you can add your own if you don't have enough. Now I'm gonna have to make s'mores! Yummm!!! We all love s'mores; so much so that even though I never have bought pop tarts, we saw "s'mores pop tarts" at the store this weekend and just had to buy some! Although they are good…..there's nothing like "real" s'mores!! Finally you asked a question I think I know the answer too – but first – the pics are – as always – awesome! I thought that you 'added' the grain on purpose – or maybe I'm just used to looking at low / limited light work! the displaced 'flames' – you probably have a UV filter on your lens (a good idea – protects the lens itself from damage and a cheap investment). The light source is reflecting off the convex surface of the lens itself and striking the flat surface of the filter where it is reflected back into the lens and hence on the exposure. A combination of low light and soft (or dynamic) light sources is required to make that happen. It's typcially the 'ghost' you see in all those scary pictures on tv and the web. But it makes for some really great effects! Wow, Aus… is there anything you DON'T know?!? That totally makes sense and of course, I'd have NEVER thought of it! So I should just take the filter off for these occasions?? Love the s'mores at our house, too! We usually start with wiener roast first and follow with s'mores. 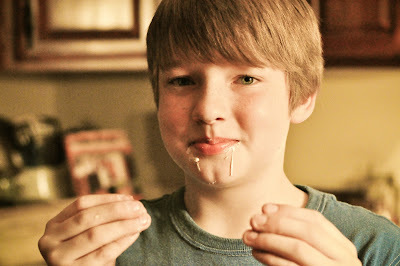 They're fun with coconut covered marshmallows, too. It's those simple summer nights that we remember, isn't it?